The previous demo shows/hides paragraph between the heading paragraphs. This demo has multilevel numbered paragraphs, and higher level paragraph hides/shows deeper paragraphs. Numbering is implemented by LabelItem type. It's possible to use "real"
numbering, but "real" numbering cannot have plus/minus pictures before it. It's visually like the previous one, but plus/minus pictures are after numbering. need labelitems and special paragraph styles. Visually, this demo is like the first one. But unlike all the demos above, it does not need a second TRichView containing a full document. Instead of deleting collapsed paragraphs, this demo hides them. 2008-May-14: for compatibility with TRichView 10+. Last edited by Sergey Tkachenko on Fri Jun 28, 2013 6:44 pm, edited 2 times in total. Is there a way to do it without a full copy of the document? As it's not good for big docs. There is an option to hide/show selected text in rvActionsDemo (buggy), maybe we can use it instead? It is possible using a hidden text, it can be shown/hidden using rvoShowHidden text in Options. The same option used in the ActionTest demo. There are no known bugs for this feature. If you know a bug, please explain how to reproduce it. Sergey Tkachenko wrote: There are no known bugs for this feature. If you know a bug, please explain how to reproduce it. There is no way to detect hidden text in your rvActions demo. You select text, press hide and it hides. After that pressing hide again does nothing. 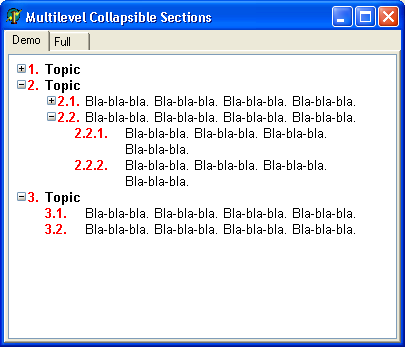 A demo for collapse/expand with [+] sign and hidden text will be useful. Thanks. Hidden text becomes visible if you press "Show special characters" button (displayed as Pi-character), so you can unhide it. I'll try to make a demo in this weekend. Actually, it is simple. All content that must be hidden when collapsing is added using "hidden text" options. Is there a demo available? Using hidden property instead of additional RVE. Of course, I was wrong by expanding/collapsing using rvoShowHiddenText option. 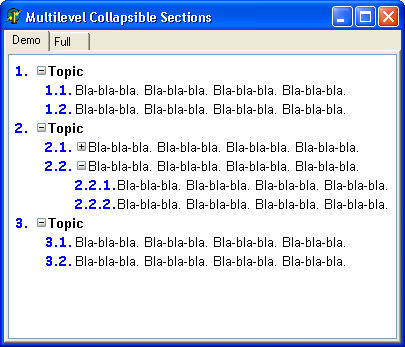 This option could be useful if you need only "expand all" and "collapse all" commands, it cannot be used to expand/collapse only the desired parts. The correct solution is making collapsed fragments hidden.